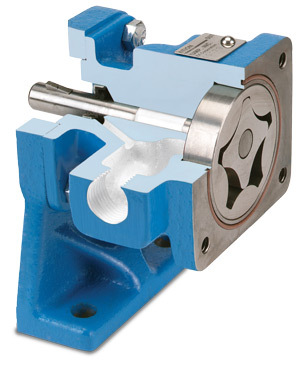 Gerotor pumps are internal gear pumps without the crescent. The rotor is the internal (drive) gear shown below in gray, and the idler is the external (driven) gear, shown below in orange. They are primarily suitable for clean, low pressure applications such as lubrication systems or hot oil filtration systems, but can also be found in low to moderate pressure hydraulic applications. 1. Liquid enters the suction port between the rotor (gray gear) and idler (orange gear) teeth. 2. Liquid travels through the pump between the teeth of the "gear-within-a-gear" principle. The close tolerance between the gears acts as a seal between the suction and discharge ports. 3. Rotor and idler teeth mesh completely to form a seal equidistant from the discharge and suction ports. This seal forces the liquid out of the discharge port.